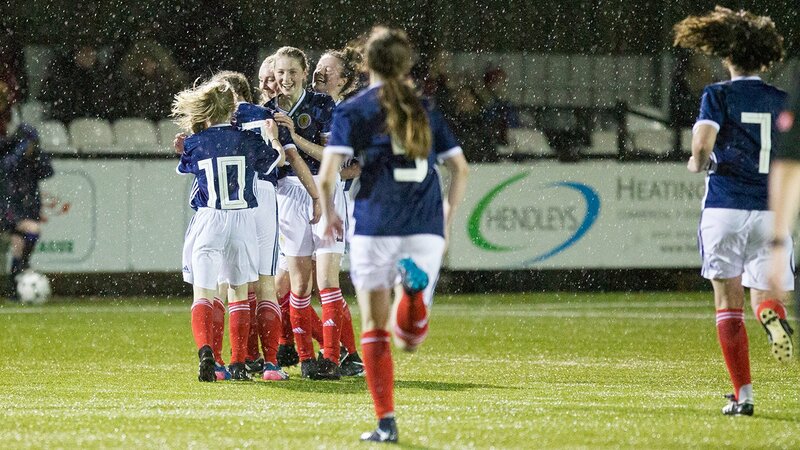 Scotland’s U15 girls opened their 2018 campaign with a friendly International challenge match against their Welsh counterparts in appalling conditions at Llandudno football Club in North Wales. Near gale force winds and driving rain throughout the game made thing difficult but to the girls’ great credit both teams attempted to play constructive football. As the game started it was obvious to the home supporters and the noisy travelling support that playing the kind of passing football that the young Scots like to play was going to be very difficult. The game started positively for both sides. The players attempted to get the ball down and play, however the driving rain and high winds hampered the early passing moves from both sets of players. The Scots solid back three of Paige, Jenna and the captain Robyn set a foundation for the others to follow. Lynsey on the left and Rebecca on the right worked their way into positions to get the ball into dangerous areas for the strikers to attack. However the first real chance in the game dropped to the Welsh. As the ball broke kindly in the area from a misplaced clearance the Scots keeper Alicia saved bravely at the feet of the advancing Welsh forward. This great save lifted the Scots who were now finding their feet. Monica and Kate drove through the centre of the pitch and linked up well with both Rosie and Bayley in the advanced areas. Kirsty provided the link between the strikers and the powerful midfield duo. As the Scots settled into their attacking game and it was only a matter of time before the deadlock was broken. Rebecca, who had been working tirelessly on the right hand side, opened the scoring with a powerful left foot drive from 20 yards after a cross from the left by Bayley had beaten all of the Welsh defenders. The team grew in confidence and Kirsty was unlucky not to complete a great passing movement featuring the strike partnership of Rosie and Bayley. Rosie herself was only inches wide of the mark after her clever footwork had left the Welsh defence stranded. Wholesale changes in the second half did not adversely affect the flow of the match and with 2 minutes gone in the second half Eilidh found Ellie Jai with a wonderful ball inside the Welsh left back. Ellie Jai used her pace to outstrip the defence and fire a powerful shot low into the net for the second and fully deserved second goal. Mirin was now steadying the ship in the orthodox left fullback role as she pushed her opponent back towards her own goal. On the right both Jessica and Ellie Jai were linking up well providing ammunition for Eilidh and Vhairi to attack the Welsh defence. Olivia was now getting on the ball probing and tormenting the defenders and supplying the strikers with the kind of passes that they both strive on when it is played down the side of the central defenders. At this stage in proceedings Wales were finding it difficult to get out of their own half as the Scots employed a pressing game which brought about several corners and it was this tactic that met with dividends in the 51st minute when Eilidh prodded in a 3rd goal from a dangerous Ellie Jai corner from the right. There was a small consolation for the Welsh 7 minutes later as the swirling wind confused the defenders and attackers together but the bounce of the ball favoured the Welsh striker who knocked the ball home. Minutes later the Welsh striker had a second attempt at goal but it was confidently saved by Gail in the Scots goal.